The Water in La Chiripa TRAILER from Angel Granados on Vimeo. The community of La Chiripa, El Salvador suffers from water-related illness associated with limited access to potable water and poor hygiene practices. La Chiripa (pop. 100) is a rural, agricultural Salvadoran community located in southeastern El Salvador within the region of El Tigre and the Municipality of Santiago de Maria, nearby the city of Santiago de Maria (pop. 28,616). La Chiripa is made up of 24 households distributed linearly over approximately one mile. The community is situated in the mountainous, coffee-growing region of El Salvador and is surrounded on all sides by privately-owned coffee farms. Community members work on these farms year-round, earning $4 per day. The project is a partnership with La Chiripa residents to improve health conditions and quality of life of residents through the implementation of potable rainwater household systems and health education and training. The 100 residents of La Chiripa have no potable water infrastructure. To obtain water, community members either hand-carry water from a low-flow spring, collect household rainwater, or walk to a municipal water distribution system in a nearby town to purchase water. During El Salvador’s six-month dry season with virtually no rainfall, there is not adequate water for residents. Additionally, the community lacks adequate waste management. Trash is discarded openly around homes. Residents frequently suffer from illnesses linked to poor water quality and unsanitary conditions, such as respiratory infections, diarrhea, and parasites. To improve community health and well-being, the project uses a multidisciplinary and collaborative approach that consists of developing La Chiripa’s water supply as well as addressing key hygiene behaviors that could propagate disease. Specifically, the project will undertake training and education in ensuring safe household water handling and storage, hygiene, grey water disposal, and solid waste management. For the public health training components of the project, EWB-USA SD is partnered with graduate public health students from San Diego State University (SDSU) and the University of California – San Diego (UCSD) to develop and implement the health education and training program. 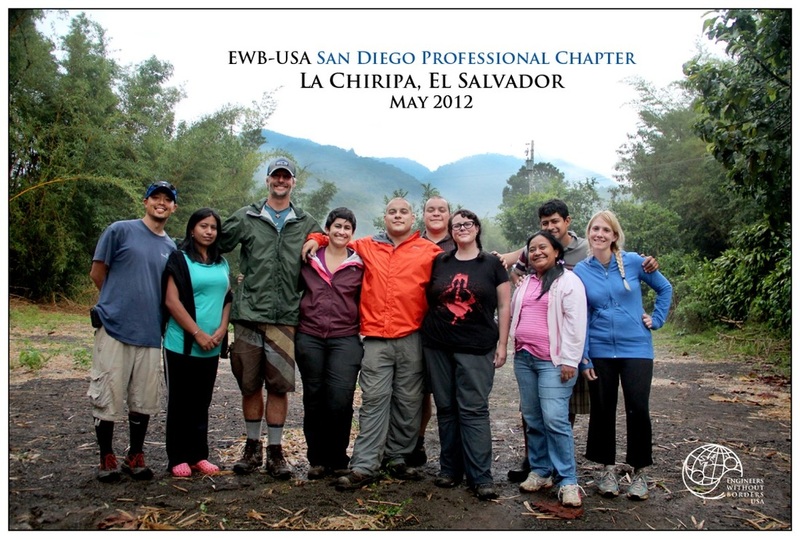 EWB-USA SD first traveled to La Chiripa in October 2009 to assess community needs and develop a partnership. EWB-USA SD returned to the community again in March 2011 to discuss system design and plans with residents. EWB-USA SD is currently working on the rainwater system design and the health education program. Construction of the household rainwater catchment systems will occur in two phases. Phase I, planned for May 2012, will involve the construction 2-5 rainwater systems. In Phase II, EWB and the community will construct all remaining household rainwater systems (January 2013). EWB intends to continue work in region and to maintain a long-lasting partnership with La Chiripa residents. With a potable water system in place and the empowerment of residents to identify and manage projects to address local issues, the project will allow the residents to improve their standard of living for generations to come.